Obituary for Nancy Fay (Posio) Kinnunen | Bowerman Funeral Home, Inc.
Nancy Fay Kinnunen, age 79, of Munising, died Saturday morning, July 14, 2018 at Medilodge of Munising with her loving family at her side. She was born on December 12, 1938 in Munising to John and Viola (Mackie) Posio and was raised at the family home at Forest Lake. During high school, Nancy would travel to an island lodge in Canada with her Aunt Elma and Uncle John Lammi and they would cook for the guests. It was there where Nancy learned her cooking and baking talents. Nancy graduated from Eben High School in 1956 and then married Reino Kinnunen on July 27, 1957. A daughter Carol was born to them in 1958 and together they lovingly raised her. As a family, they would join Elma and John at Orelton Farms in Ohio where they cleaned and packed fresh corn. Nancy continued to work hard throughout her life and went to work at Hub’s Super Valu as a cashier and found her way to Madigan’s Hardware. Later she began working at Hartho where she worked as a veneer grader. Nancy would get to work an hour and a half before she clocked in so she could make sure there was coffee available for everyone. She retired from Timber Products in 2000 after twenty-five years of service and then returned to work again at Madigan’s Hardware where she would share her humor with customers. Nancy was an excellent cook and baker and she generously shared her talents with others whether at church, with family, or with friends. She enjoyed making maple syrup, canning applesauce, and coming up with ways to make and share her own grown rhubarb. She was not only thoughtful and giving with people, but she always kept treats in her car so she could share them with dogs that she encountered on her daily travels. Nancy enjoyed bowling and loved coffee with the girls in the morning and then at 7:00 p.m., her evening social hours began as Reino was fast asleep. Nancy and Reino had a great garden filled with raspberries, vegetables, and beautiful flowers that surrounded their home. They enjoyed snowmobiling back in the day with their friends and spending all four seasons together at their camp on the 440. Nancy was a member of the Eden Lutheran Church and a proud member of the Democratic Party where she was involved with their community volunteer outreach programs. Family meant the world to Nancy and she and Reino were blessed with nearly fifty-four years of marriage when he preceded her in death on April 16, 2011. Nancy loved camping with her grandkids and friends at Wide Waters and she loved to take the grandchildren and spoil them on the weekends. She also enjoyed supporting her grandchildren and great-grandchildren in their sporting events, programs, and activities. Nancy lived her life as a proud Finn until the end with much SISU. She was a devoted Lions fan that never missed a game to cheer them on. Even though her body was short in size, her heart was full of love and she spread her joy and hugs to everyone that encompassed her. Nancy is survived by her daughter and son-in-law – Carol and Jim St. Amour of Munising; grandchildren – Jamie and Barry Johnson and Mike St. Amour (Katie Stickels); great-grandchildren – Matthew, Alex, Trevor, Valerie, and Natalia; brother – Bruce Posio (Sharon Cearley) of Munising; sister – Donna (Fred) Van Dellen of Minneapolis, MN; in-laws – Mort Hendrickson, Nancy Lindell, and Jerry (Roberta) Kinnunen; and numerous nieces, nephews, and friends. She was preceded in death by her parents, husband Reino, and siblings Johnnie Posio, Bonnie Barnett, Joyce Hendrickson, granddaughter-in-law Laura St. Amour, and numerous in-laws. 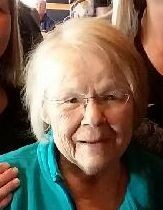 Visitation will be held at the Bowerman Funeral Home on Tuesday evening from 5:00 until 8:00 p.m. Nancy’s funeral service will be held at the Eden Lutheran Church in Munising on Wednesday, July 18, 2018 at 11:00 a.m. Interment will be at the Maple Grove Cemetery in Munising. Nancy will be escorted by Mike St. Amour, Barry, Matthew, Alex and Trevor Johnson, and Bob Underwood.